When we think of cinnamon, we may think of apple pie and sticky buns, but cinnamon is more than an aromatic spice: it is also a strong medicinal herb used for thousands of years for a variety of ailments. A study found that taking a cinnamon extract for three months helped people with type 2 diabetes have better blood sugar control. According to Nutrition Research, a study in China followed 66 people being treated for type 2 diabetes, divided into three groups. For three months, the first group received 120 mg of cinnamon extract per day, the second group received 360 mg of cinnamon extract per day, and the third group received a placebo. The cinnamon extract was highly concentrated—40 grams of crude cinnamon was used to make each gram of extract—and given as tablets. All of the participants also used an anti-diabetic drug called gliclazide throughout the study. Fasting blood glucose levels were reduced in cinnamon users, but not the placebo group, suggesting that cinnamon improved their bodies’ ability to keep blood glucose down between meals. Hemoglobin A1c levels were also lower in both cinnamon groups, but not the placebo group, meaning that cinnamon use was associated with better long-term blood glucose level control. Fasting blood glucose and hemoglobin A1c levels appeared to improve more in people taking the higher amount of cinnamon than people taking the lower amount. Triglyceride levels, which tend to rise when blood glucose levels are chronically high and are associated with an increased risk of heart disease, were reduced in the group that took the lower amount of cinnamon, but not in the group that took the higher amount. “Based on our observations as well as other groups' reports, we propose that cinnamon be considered a promising supplement for the therapy of type 2 diabetes when hyperglycemia [high blood glucose levels] cannot be satisfactorily controlled by other strategies such as diet, exercise, and prescribed medication,” the researchers said. 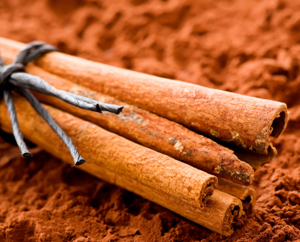 Cinnamon is an important herb in both traditional Chinese and Ayurvedic medical systems. Historically, it has been thought to strengthen the immune system, promote good circulation, ease digestive ailments, and fight bacteria and viruses. Breakfast. Adding cinnamon to hot porridge made from whole grain oats or another whole grain is a warm way to start the day. If you’re trying to keep blood sugar stable, use only whole fruit like apples or blueberries to sweeten your spicy porridge. Lunch. Cinnamon adds a sweet and pungent flavor to soups and other dishes made with sweet potato or winter squash. Sprinkle cinnamon on apple slices for dessert. Dinner. With companion spices like cardamom and cumin, cinnamon is an important spice in curry dishes. Try a curried lentil soup or a chicken and vegetable curry. Add flavor to whole grain rice by sprinkling it with cinnamon and a little olive or sesame oil. Tea time. Traditional chai tea has lots of cinnamon. Unsweetened or lightly sweetened is best, and look for one without caffeine if you are sensitive or want to drink it in the evening.